When you wish to submit any type of SMS message, including MMS notifications or WAP push messages, you must submit the request via the gateway’s web interface. The “Web” configuration dialog contains settings relevant to this web interface. “Port number for web interface” – Configure the gateway to listen for web/HTTP requests on a particular TCP/IP port number. The standard web port on the internet is 80, however you will most likely want to use a non-standard port for this service. The service defaults to the non-standard port 8800. The PC that is running the gateway might have other web services installed. For this reason, the gateway allows you to specify which of the available IP addresses on the current PC should be used by the gateway. The “IP Address for web interface” prompt displays the available IP addresses on the current PC. To make the gateway service available via any address on the current PC, select “(all available)”, otherwise select a specific IP address. “Enable menu driven web interface” specifies whether or not an HTML menu will be displayed when a user connects to the gateway via the web interface. This menu interface can be helpful when you are first exploring the features of the gateway. If this menu setting is disabled, then the gateway will require the appropriate URL parameters to perform any tasks. These URL parameters are defined elsewhere in this document in the section titled Submitting SMS Messages – URL Parameters. Checking “Enable SMPP Server” enables the SMPP Server module of the gateway. While the gateway has the ability to act as an SMPP client, sending and receiving messages through an external SMPP server, it also has the ability to act as an SMPP server to provide message sending and receiving services to other SMPP clients. When you enable the SMPP server, you must specify a TCP/IP “Port number for SMPP Server”. This is a local port number on the gateway PC, which must not be in use by any other applications. The gateway will listen for SMPP clients to connect to the gateway on the port specified. User accounts for SMPP clients are defined on the “SMS Users“ configuration dialog. The “SMPP Options” button displays some configuration options for the SMPP Server, and is described at the end of this section. To prevent unauthorized access to the gateway, access should be limited. For most applications, it is recommended that this gateway be installed inside of your firewall, to help ensure that users on external computers cannot access the gateway. As further authorization measures, the gateway can also limit access by restricting address to a limited range of IP addresses, and by requiring a username and password for access. To define that a username and password be required for access to the gateway, check “Require Authentication for web interface”. HTTP requests must include this username and password in order to issue requests to the gateway. (Note: A standard web browser will prompt for the username and password.) The “SMS Users“ configuration dialog defines user accounts that can access the gateway. To restrict access to the gateway to a limited range of IP addresses, “Allowed” and “Blocked” lists may be defined. When the gateway receives a new web request, it consults the “Allowed” and “Blocked” lists to determine if web access is allowed from the IP address of the machine that issued the request. If an address is listed on the “Blocked” list, access will be denied, and the web interface cannot be used to submit an SMS message from that address. If an address is not listed on the “Blocked” list, and an “Allowed” list is not defined, the web interface can be used to submit an SMS message from that address. If an address is not listed on the “Blocked” list, and an “Allowed” list is defined, access will be denied if the address is not included in the “Allowed” list. It is also possible to define IP address restrictions for individual “SMS Users” accounts. Checking “Enable Web Account Administration” enables a web-based administration interface that allows for adding, modifying and deleting user accounts that are defined to the NowSMS server. Both “SMS Users” and “MMSC Users” can be edited via this web interface. To enable this interface, you must define both an “Admin User Name” and “Admin Password”. This user name and password must be supplied upon attempts to enter the admin interface. When the Web Account Administration interface is enabled, it is accessible by connecting to the “Port number for web interface” with a relative URI of “/ADMIN”. For example, http://127.0.0.1:8800/ADMIN. The Web Account Administration interface allows for the creating, editing and deleting of “SMS Users” and “MMSC Users” accounts. It also displays statistical information about the server, and provides remote access to NowSMS log files. 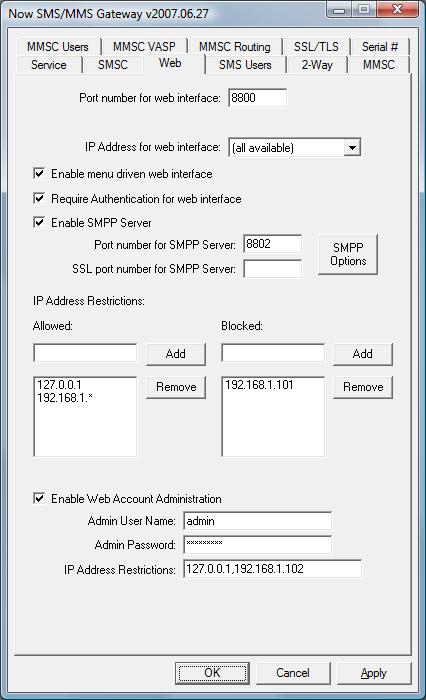 The “SMPP Options” button displays some configuration options for the SMPP Server.